iFitness application for iPhone. Are you worried about the increasing flab that you are accumulating on your body? Too busy to hit the gym after you piled on the pounds after delivering your baby? Or is your gym too crowded which is why you cannot get access to any of the personal fitness trainers? Don’t worry, help is at hand. Thanks to Apple and its impressive bouquet of amazing applications, users of iPhone can now enjoy the iFitness application on their phones. This application enables users to watch and practice various exercise and fitness regimes from their iPhones, without any assistance. This comprehensive application can be downloaded and installed from the Apple website onto the iPhone. The fitness application for iphone is featured in the iTunes App Store, under the Health and Fitness category. The application has about 115 exercises which are depicted pictorially, thereby making it a great advantage for new gym-goers. Each exercise can be accessed by three lists- by muscle group (abdominals, arms, back,etc. ), by muscle and alphabetically by exercise name (it starts with “ab crunch on a ball,” and ends with “Zercher squat”). The exercise can be viewed by simply tapping on the name of the exercise on the screen of the iPhone. When the name of the exercise is tapped upon, two images pop up which shows a person performing the particular exercise. These images are really helpful in providing the basic information on how to go about performing the exercise. These pictures are useful in demonstrating on how to go about doing any exercise, step by step. This is why one can use this application even without a gym trainer, physical therapist or a sports trainer. For more detailed information about the workouts, one can mark the quote mark icon, present at the top of the screen. This provides a detailed written description on how the exercise is to be performed. 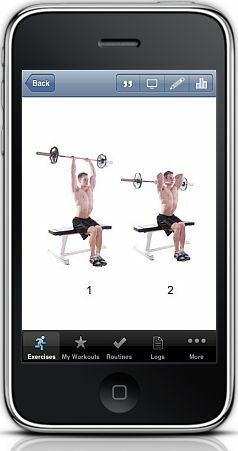 iFitness iPhone application includes nine routines which include routines for the beginner, abdominal defining, weight loss, muscle building, strength building, etc. One can also practice exercises without gym equipments; with the help of the “business routine”, as most of the exercises requires one to use basic gym equipments. Every routine includes a list of exercises, besides an optional number of sets and repetitions. The application also enables a user to add his/her own custom exercises. A user is also given the freedom to add details about the target region or target muscle and its difficulty, import images, provide a name for the exercise and write a detailed description for the exercise. It is precisely this aspect of iFitness that makes it so attractive for fitness freaks as well as physical trainers. It gives a user to design his/her own workouts based on his/her own body type. These custom made exercises added by users are seamlessly blended into the main list of workouts which is arranged alphabetically. This power packed application is available for about 2 dollars. This is a pretty reasonable price, considering how handy, compact and useful this particular application is for fitness freaks. Download this Great Fitness iPhone App here.